REDD talks have gotten bogged down in Durban on the question of how to ensure that the people and species living in the forests don’t get short shrift. It’s an issue that voluntary markets have been dealing with for years, and this new tool can make the job easier. REDD talks have bogged down in Durban on the question of how to ensure that the people and species living in the forests don’t get short shrift. It’s an issue that voluntary markets have been dealing with for years, and this new tool can make the job easier. SBIA Launch Webinar, Nov. 22, 2011 from CCBA on Vimeo. 3 December 2011 | DURBAN | Negotiators from around the world are working to develop a global mechanism for slowing climate change by saving endangered rainforests and capturing carbon in trees, but an old issue has once again brought talks to a halt. That issue is “safeguards”, or how to ensure that forests aren’t saved at the expense of the people living in them. It’s a sticky issue, and one that the Community, Carbon, and Biodiversity (CCB) Standards have been wrestling with in the voluntary carbon markets for years. More than 40 projects have already been validated under the Standards, and CCB projects accounted for roughly 60% of all forest carbon projects tracked in Ecosystem Marketplace’s report State of the Forest Carbon Markets 2011: From Canopy to Currency – making them by far the leading standard for “non-carbon” values. The CCB Standards clearly mandate that social and biodiversity benefits, like carbon impacts, must be ‘additional’ – meaning that the social benefits are due to the project rather due to other factors. This means it’s critical to determine which results can be attributed to which activities – and this is also the hardest part of any impact assessment. The traditional approach to attribution is to use the experimental or quasi-experimental method (also known as ‘matching methods’) involving comparisons between control and treatment (or project) communities or individuals. But this is too expensive for most forest carbon projects, as well as being problematic as regards finding good ‘controls’ and on ethical grounds. Another key challenge for SIA is the nature of social impacts. The social impacts of terrestrial carbon projects (or of any other projects) are, by their very nature, intangible and difficult to predict and measure because they are mainly felt over the longer term, and many of them are indirect. We also have a weak empirical basis for understanding the social impacts of carbon projects, partly due to the lack of credible monitoring in the past, but also due to the short history. It is no wonder that there are so many contested viewpoints on the social impacts of forest carbon projects! Following a research process which started in 2008, the conclusion was reached that the ‘theory of change’ approach (or theory-based evaluation) is more cost-effective for terrestrial carbon projects. Such a process works by examining a project’s theory of how it will achieve its objectives based on a cause and effect analysis. It is incorporated into the project development process from the start, and works by first establishing a sequence of events or project results that will lead to the desired objectives (or social impacts) and then looks for carefully chosen indicators that will measure short- and mid-term outputs along that causal chain. If the projected outputs and outcomes are materializing, then developers can be confident that long-term objectives or impacts will be met. If they’re not, then it’s time for some re-evaluation. In the SBIA process, this is achieved by holding multiple stakeholder workshops in which the participants are divided into groups to examine the priority social and biodiversity issues. Each group performs a problem-tree analysis of its “priority issue” – such as alleviating poverty, empowering women, promoting better local governance, developing sustainable agricultural livelihoods or protecting an endangered species – and then draws up a roadmap of how to achieve it. This approach is also used by the micro-finance sector as a cost-effective approach to social impact assessment in the light of the high cost of ‘matching methods’. The methodology developed for terrestrial carbon projects draws heavily on the ‘Open Standards for the Practice of Conservation’ developed by the Conservation Measures Partnership (2007) and supported by the on-line Miradi software. The NGO partners published a provisional manual in 2010, and this was subsequently peer reviewed and field-tested on three REDD projects. Based on the case studies and peer reviews, a thoroughly revised and more user-friendly “Social and Biodiversity Impact Assessment (SBIA) Manual for REDD+ Projects” (version 2) was released in October 2011. The manual divides the impact assessment process into seven steps, known as the SBIA stages, which meet the CCB requirements for a participatory design process. This serves not only to measure outputs, but to keep participants focused on outputs in ways that they might not otherwise be. The first SBIA stage brings in all participants and creates a focus on those outputs that the project can achieve without getting bogged down in areas that it can’t have much impact. After establishing that focus and bringing in the key stakeholders, the process moves on to analyzing the negative and positive (for some stakeholders) outcomes of the business-as-usual approach, then laying out the causal chains of how the project can achieve its objectives, then evaluating what can go wrong with the project and aiming to minimize that, then identifying the most cost-effective indicators for the monitoring and evaluation process. Although the SBIA Manual is mainly oriented to the CCB Standards, it can be used for other multiple-benefit standards and other types of PES projects. The benefits of the ‘theory of change’ approach to SBIA go well beyond credible monitoring and include: strategic project design necessary for achieving social and biodiversity objectives; effective participation of project stakeholders; promotion of adaptive project management; and ease of understanding to a range of stakeholders. Forest Trends also believes it has high potential to be applied at national-level REDD+ as a tool for ex-ante impact assessment and adaptive program management, as well as for M&E. DRC in September 2011 organized by UNREDD and Forest Trends. In each training course, roughly 20 participants – mainly project proponents, support NGOs and government staff – worked through two case study REDD+ projects: the two cased studies in the Tanzania workshop involved TFCG and Care International; the two in the Kenya workshop were projects of the Green Belt Movement (Kenya) and of Jane Goodall Institute(Uganda); and the two in the DRC workshop were projects supported by the National REDD Coordination office in coordination with WCS and WWF. The first full-scale application of this approach in the world has been with the project “Making REDD work for communities and forests in Tanzania” implemented by TFCG in conjunction with Tanzanian Community Forest Conservation Network (MJUMITA). This project emphasizes direct and equitable incentives to rural communities to conserve and manage their forests, including through strengthened local governance, land-use plans, sustainable agriculture, developing a carbon trading cooperative to aggregate and market the carbon, and community development plans. The work was undertaken over a four-month period in early 2011 by TFCG staff who had attended the SBIA training course, with support facilitation by Dr Tuyeni Mwampamba, an SIA specialist from Tanzania who also co-facilitated the Tanzania and Kenya training courses. Social impact assessment (SIA) workshops were undertaken at the village and landscape scales. At the village scale, TFCG staff held three-day workshops in each of 13 villages with representatives from all sub-villages with a focus on the early stages, and at the landscape scale, a four-day ‘landscape stakeholder workshop’ was held. In all there were 375 participants in the village workshops and 65 in the landscape workshop. The aim of the landscape-level workshop was to validate and consolidate the information generated by the village workshops and to arrive at a set of road maps or ‘results chains’ for each of the priority social impacts. These workshops were complemented by in-depth stakeholder analysis in five representative villages in conjunction with an analysis of deforestation drivers, and focus group discussions with women and other stakeholder groups conducted by an independent consultant. 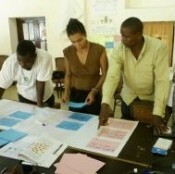 This process resulted in the identification of eight priority social issues for the REDD project ; a ‘problem flow diagram’ of each social issue; a theory of change for each issue of how the project stakeholders think that key social outcomes can be achieved; an analysis of risks and potential negative impacts, and how to mitigate them; and a community development plan outlining the social changes that the communities expect the project to bring about directly or indirectly. Due to these workshops and follow-up work this REDD project now has a clear strategy for achieving its social objectives and reducing the social risks; a credible monitoring plan which meets the CCB Standards (this was put together by Dr Mwampamba based on data from the workshops); good community buy-in to this plan as a result of the highly participatory process; and a strong basis for adaptive management. TFCG deserves great credit for investing in a ‘state of the art’ SIA exercise which will prove to be a vital learning experience for other REDD+ projects in Africa. For Mike Korchinsky, REDD is as much about people as it is about trees – perhaps even more so. His company, Wildlife Works, is behind the Kasigau Corridor REDD Project – Kenya’s first REDD project covering 500,000 acres of territory and involving more than 3000 individual stakeholders. With that in mind, he’s following in the footsteps of TFCG. In October, 2011, the Kasigau Corridor REDD project in Kenya held a multiple stakeholder SIA workshop, shortly after their social and biodiversity monitoring officer, Mwangi Githiru, attended a Forest Trends SBIA training workshop. The Kasigau SIA workshop, attended by 35 (mainly local) stakeholders developed ‘problem flow diagrams’ and theory of change ‘results chains’ for five priority issues (governance, poverty, human-wildlife conflicts, environmental degradation, and education) outlining how the project hopes to overcome these problems – and thereby achieve its objectives. A future workshop will assess the key risks and negative impacts, and develop the indicators and monitoring plan. ← What is Up Next for Forest Carbon after Durban?